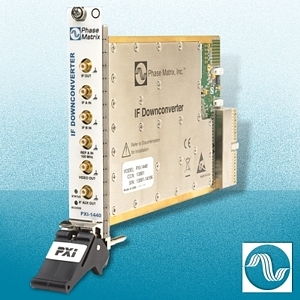 The PXI-1440 IF Downconverter Module is a PXI 3U, 1-slot module that facilitates additional frequency translations to lower intermediate frequencies (IF) when high-dynamic range digitization is required. The module can receive multiple IF inputs from two different donconverter modules. The IF-input signals can either be bypassed and sent out in wideband mode or filtered and further down converted before being up routed to the appropriate alias filter for additional processing in the narrowband mode. The two input sources to this module are normally the IF signals from the RF Downconverter Module (PXI-1430) or from the MW Downconverter Module (PXI-1420). Additionally, the PXI-1440 contains video-processing circuitry to enable video demodulation or IF video triggering implementation in a PXI downconverter system. Features and controls include: incoming signal routing, anti-alias filter routing, IF output routing, LO level indicator, and several signal-path options for testing.